Taking Ownership of OUR PROBLEM . . . .
Little did the son know that, from the time he left to squander his inheritance, his father had watched and prayed for his safe return. God does the same for you and me. He watches and waits for us to “come to our senses” in repentance and faith. The Heartstring Illustration is a useful tool that helps us turn to God for the help we need to identify OUR PROBLEM. It is a simple means of gaining clarity when life appears chaotic. I was first introduced to the Heartstring Illustration when working in a counseling office located above our local Pregnancy Help Center. (I share this story because it is the simplest way to illustrate the value of the model.) When a woman who was abortion-minded came to the Center, one of the Counselors would sit down with her to talk about her situation. Looking at the triangle, on the bottom right they put the Client’s name; to the left of the triangle they wrote, Unwanted Pregnancy. Then they asked the question: “Who or what is influencing your decision about your baby?” Whatever answer that was given–pressure from boyfriend or parents, fear, money, etc–was written at the top of the triangle. 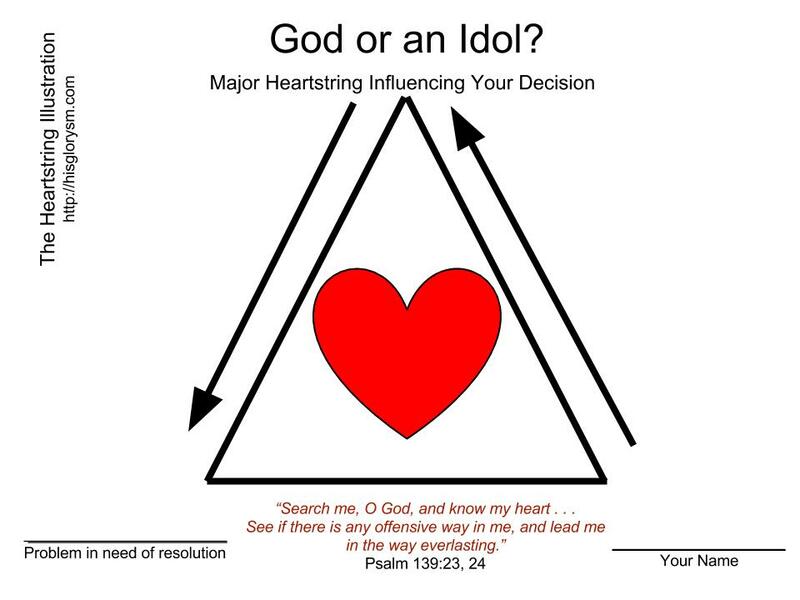 The Counselor then talked about how we will all be held accountable by God for our decisions; that we cannot shift the blame to others or to our circumstances, Also, the Counselor explained that anything listed at the top of the triangle other than God–is an idol. The Counselor then asked, “Who or what do you think should be at the top as you make this decision?” To the best of my knowledge, every woman knew the answer: GOD. I have also been helped personally using the model, when I have been tempted to blame Him for my troubles or sense a distance in our relationship. “Search my heart God . . . clean house as You see fit . . . He proves Himself faithful every single time. who speaks and works in the hearts and minds of all who seek Him. Go to Him NOW–He is worthy of your trust! * For twenty-plus years I referred to this model as, The Triangle Illustration–doesn’t exactly stir the heart, does it?! As my son Luke was helping me put together the illustration for this post, I mentioned my frustration at not having a better title. Luke (a puppeteer) suggested, heartstrings. I thought about it and BAM! It was a great fit, communicating the idea that, indeed, we need to be more aware of who or what is tugging at our hearts. Thanks, Luke! ‹ PreviousVoices (Part Two) . . . .
Next ›To Move Beyond Brokenness . . . . I am glad to share it and if you find it useful enough to pass it on that will be great–thank you! Hi, Kathie. good to read this post and be reminded of where my heart is in different challenges in which I’m waiting for the Lord to work. Love you, friend! Glad to be of some use in encouraging you, dear friend. I love you too! What a great tool and illustration. Thanks for sharing. I think we all can benefit from this.